Chasing Amy and Seeing Gremlins in the Fright Night Dealer Rooms! After spending most of our first night at the Fright Night/Fandomfest standing in lines we decided it was time to make our pilgrimage back to the main hotel and check out the dealer rooms they had there. 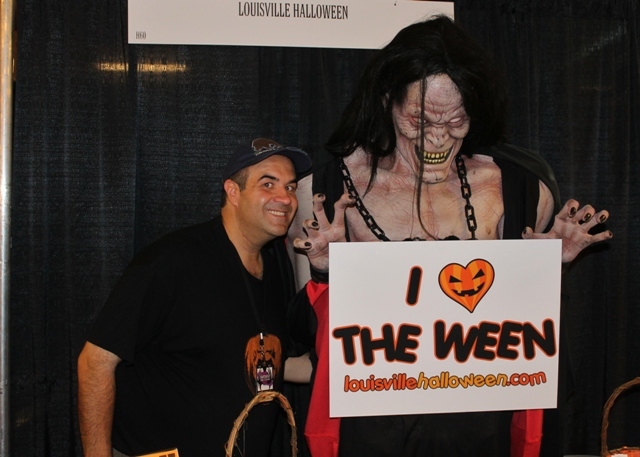 There were two main areas for vendors; the Kentucky Convention Center where the big celebrities and photo ops were (which featured more comic book related items) and the hotel which centered more on horror. Before leaving we stopped over to meet Joey Lauren Adams from Chasing Amy. She offered $20 for an autograph and an additional $10 to take a picture with her. I just wanted a picture but Russ went for the whole thirty bucks. He’d later state that this was probably due more to his blood alcohol levels at the time as opposed to his desire for an autograph. The first person I saw when we walked in was Ed from Midnight Syndicate. 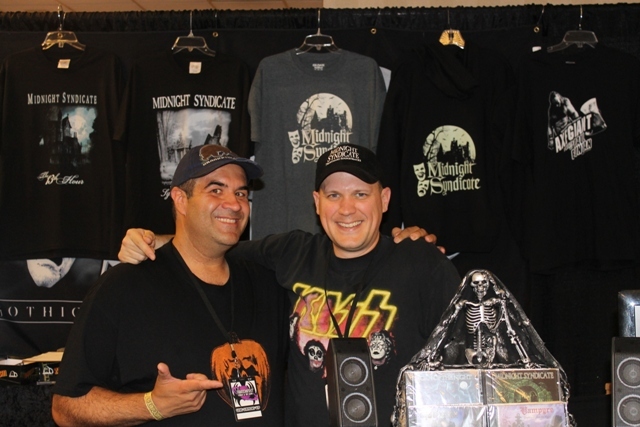 He and I had met before at Monsterbash 2012 and he’s a great guy. He sampled some of the music from their latest CD Monsters of Legend which the other Dave will be reviewing soon. 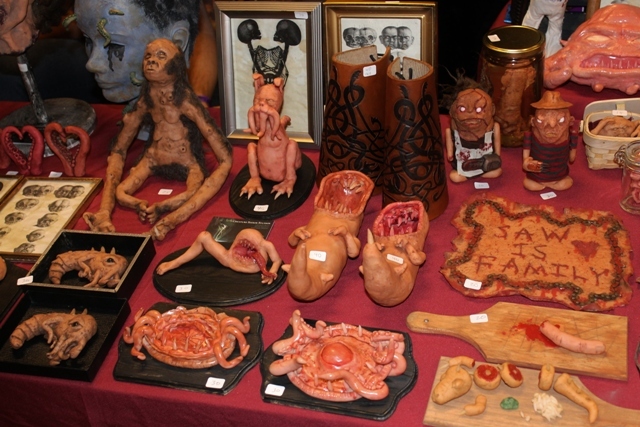 Directly next to his booth was Eric Austin from the HMA (Halloween Mask Association) who was working the table for Trick or Treat Studios. I’d last seen Eric at Horrorhound Weekend in March and, this time around, he was carrying their new Dark Night of the Scarecrow mask. Needless to say, I bought one of the two he had with him (which was cheaper than a celebrity photo op) though the other would sell too by the end of the weekend. 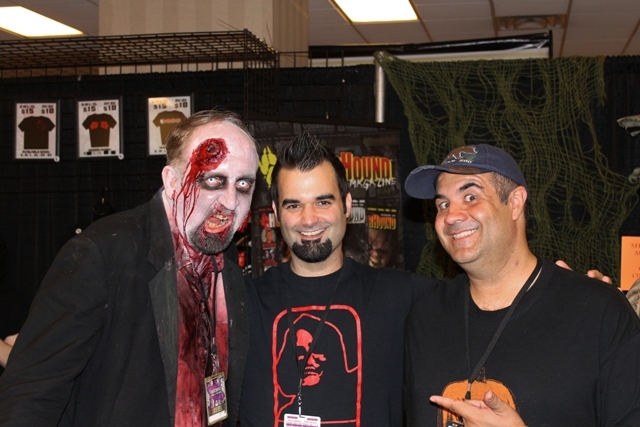 There were other familiar faces, including some seen recently at Days of the Dead, including Creature Seeker Studios. These guys made an impression with their killer sweet potatoes that I’d seen there…though the artist, Eric Brown, stated that wasn’t originally what he intended them to be. Oh well, you know what they say about art…everyone sees something different. Also last seen at Days was Tattoo Bob and his wife, Rita. Tattoo Bob is known for making some incredible life-like portraits…and with lightnight speed. I particularly liked his Gene Simmons pictures. The Cosplay at this event wasn’t much for horror as most folks who dressed up chose anime’ or Dr. WHO. There were also a lot of people dressed in Steampunk costumes as this event had some special activities geared for them. There were also celebrities located in this building, including The Walking Dead folks. I saw Norman Reedus and Michael Rooker signing next to each other. 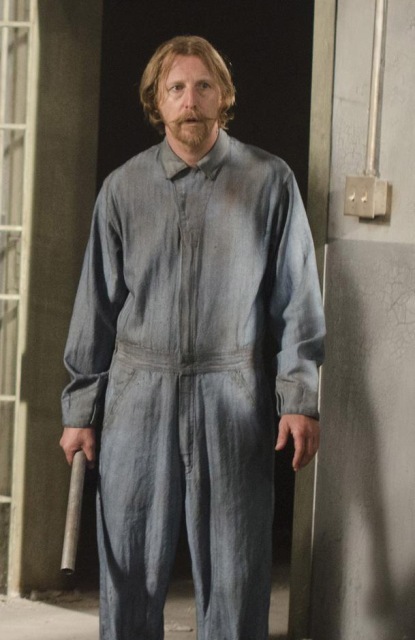 They shared the room with other Dead cast members such as Iron Singleton and Lew Temple. Temple really seemed to enjoy interacting with the fans and, as a viewer of that show, I was disappointed that his character was killed off just as he was starting to develop but such is life (and death) in post zombie apocalypse world. 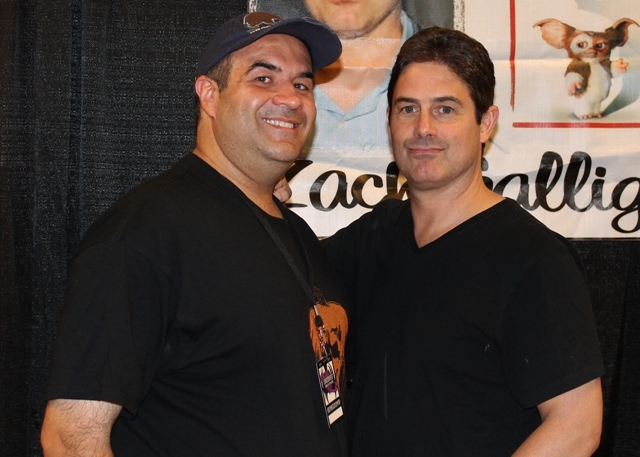 They also had another person sitting in with the dealers that was simply labeled as a “A Walking Dead Barn Zombie.” What killed me is that the guy was charging $20 for an autograph, the same price as Zach Galligan who was seated right next to him. Really? Needless to say we walked right past that glorified “extra” and met Galligan instead. I gotta say, he has aged incredibly well. 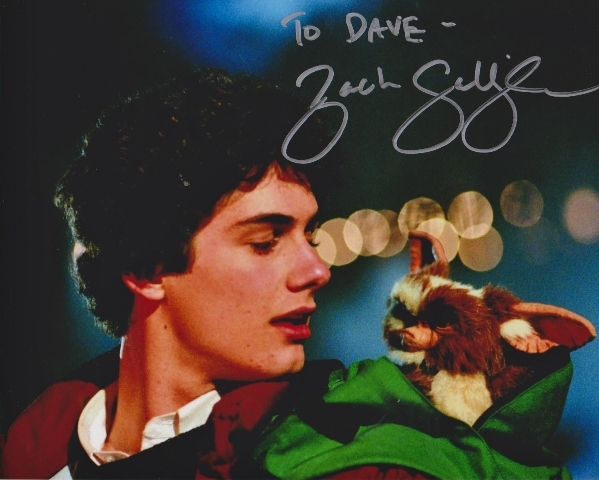 He seemed friendly enough and I asked which enjoyed filming more, Gremlins or Waxwork? He said that Waxwork was a lot quicker but he had great experiences with both. Not much in the way of insights but, then again, we were so tired from all the standing and walking it wasn’t like I had the energy to channel Barbara Walters either.I give him HUGE props, however, for charging the standard $20 which INCLUDED a picture with him. Having completed our first night we returned to our room at around 10pm and Russ immediately crashed. I stayed up a couple more hours to take notes and chat with some of the other fans in the lobby. 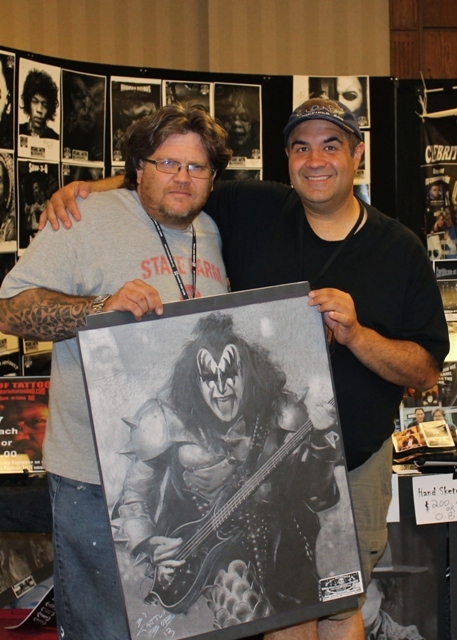 Gene Simmons wasn’t slated to appear until Sunday which meant I had another long day to get through and, having met all my other goals, no agenda. How would get through the day? Coming Up…Russ meets Stan “The Man” Lee! This entry was posted in Convention & Expos and tagged April Hunter, Brian O'Halloran, Chasing Amy, Creature Seeker Studios, DARK NIGHT OF THE SCARECROW, DAYS OF THE DEAD, Fandomfest, FRIGHT NIGHT, GENE SIMMONS, GREMLINS, Halloween Mask Association, Harry Potter, HMA, Iron Singleton, Joey Lauren Adams, Lew Temple, Michael Rooker, Midnight Syndicate, MONSTERBASH, Monsters of Legend, NORMAN REEDUS, Tara Lisa Marie Varon, Tattoo Bob, The Walking Dead', Trick Or Treat Studios, Waxwork, Zach Galligan, Zombie. Bookmark the permalink. ← Gillian Anderson sees Aliens at the Fright Night Film Fest! HAHAHA!!! I know Ap[ril Hunter…..Small world Dave.